style="text-align:center;"> Please note that this topic has not had any new posts for the last 576 days. I’m hoping someone can point me (and my father) in the right direction. This is the back story. I helped my father resolve visa problems around 5 years ago whereby his APR was increased and monthly payment amounts raised – he was paying the interest only per month on his cards with one company requesting nearly 35% APR. He has successfully (with the help of forum users) paid off all but one company. We managed to negotiate “full and final” payments with all but one of them. I believe one company tried to go with a Debt Collection Agency but we wrote to them explaining the debt was not with them but the original Visa company. The last visa company (Mint), was offered £1500 in full and final payment around 5 years ago. They refused. The debt was for around £3300. He has then successfully negotiated a monthly direct debit payment of £5 (this is with the APR remaining at 0 (zero). He is 68 years old and his income is very low. He can only afford to pay £5 per month. He has explained to them over the 5 years what his income and outgoings are. His “spare” money only equates to £5.00 every month. last month when he received a letter from Wescot. This letter informed him that they are happy to accept the £5.00 payments per month (for now). He has received a letter from Mint explaining all information regarding his account will be direct from Wescot. However, he has then received a Mint Visa bill requesting £1555.00 be paid immediately! This is obviously extremely worrying and I would like to know what is the best action to take. – no payments have been missed and their agreement of £5 per month has been broken (by them). Do I make contact with Wescot and inform them that I fully understand they have paid my fathers debt. I would greatly appreciate any help on this as he is looking to make contact this week if possible. Ignore wescot. They have no legal rights. Also can i ask if wescot say they are acting on behalf of mint? Cheers for quick reply - I'll get the letter off my father and upload it today. Thanks. when was the card opened please? The Mint card "contract" is around 8 or 9 years old. I've just checked with him and he has never missed a payment with the last one coming out on the 14th July. Its a standing order which is set up. wetcloths are only acting as agents - no powers at all! they dont even say that they arent accepting the fiver a month so keep paying it. You need to get your father to cancel the Direct Debit and pay via standing order only. A Direct Debit's amount can be varied with no knowledge to your father until the money has left his bank account, a DCA will not care if a 68 year old man goes hungry. If your father is on a low income then drop the payment to £1 per calender month, if your father has only £5 per month left spare then he is entitled to some spare money £4 per month for emergency expenditure. Yes the DCA will start kicking and screaming threatening Court etc.etc. but a DCA shouts the loudest because they know full well that a DCA is at the bottom of the receiving pile when it comes to paying bills and creditors. If a DCA rings you, refuse to go through the security questions & hang up! Thanks for information - yeah, I made a slight error..he IS paying by standing order which is excellent and good you've confirmed it's the right path. Looking at the posts here I think a letter is going to go to Mint and explain that if they require a recent expenditure form - it can be supplied along with the fact no payments have been missed and the agreement of paying them £5.00 per month has not been broken. I'll maybe post on here first before I send, just to confirm I've got all the "i's" dotted and "t's" crossed. Thanks for that - I must be cracking, up but how do I edit a previous post? As you are fully aware, I have received a letter from “Wescot Credit Services Ltd” (a Debt Collection Agency) – with the letter dated 8th July 2016. The letter informs me that my account is now being “managed (? )” by this Debt Collection Agency. It also confirms that I will continue to pay my Mint (Royal Bank of Scotland) Visa bill the total sum of £5.00 (five pounds) on a monthly basis with the next payment due on the 28th July. It also states clearly that “if” an agreement has already been setup with Royal Bank of Scotland (which it has), that I can leave all instructions for payments in place (which they are – by standing order). I am fully aware of my rights and would recommend that you continue to agree to your side of our agreement and continue to accept my offer of £5.00 (five pounds) per calendar month. As a 68 year old, retired man, I have little income with my only income being my state pension. I am quite prepared to confirm my income and outgoings with the usual expenditure form that Mint supply every year or so. What I am extremely surprised about but certainly not worried about in the slightest, is the extortionist amount that Mint (Royal Bank of Scotland) believed I could afford to pay on my July Statement. 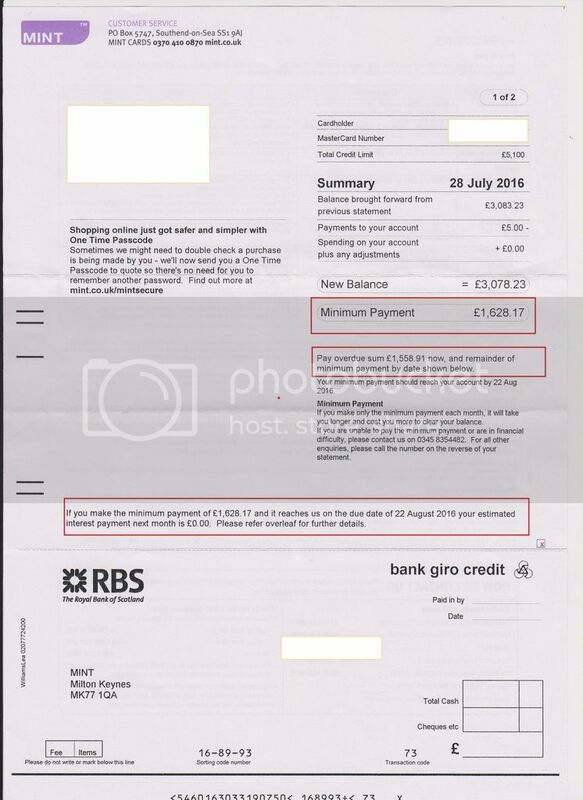 This laughable figure of £1628.17 was demanded and expected to be paid by the 22nd August 2016. I would suggest that you take a look at my agreement with your company and you will find that I have not broken any agreement and will continue to pay £5.00 (five pounds) per calendar month. You are welcome to take me to court if you believe I have broken any agreement with you but I assure you that this could and would almost certainly result in any judge reducing my affordable payments to you. At present, I am actually struggling to pay your company £5.00 per month. I would finally like to inform you that I will not be replying to any letter/phone call to the Debt Collection Agency (Wescot) you have so kindly appointed to “manage my account” and I would recommend you inform of that. I fully understand that a Debt Collection Agency has no legal power at all – I’ll repeat that last bit... they have no legal power at all. If Wescot Credit Services Ltd decide at any stage to enter any part of my land a cost/invoice of £1000.00 (one thousand pounds) will be charged to them directly. 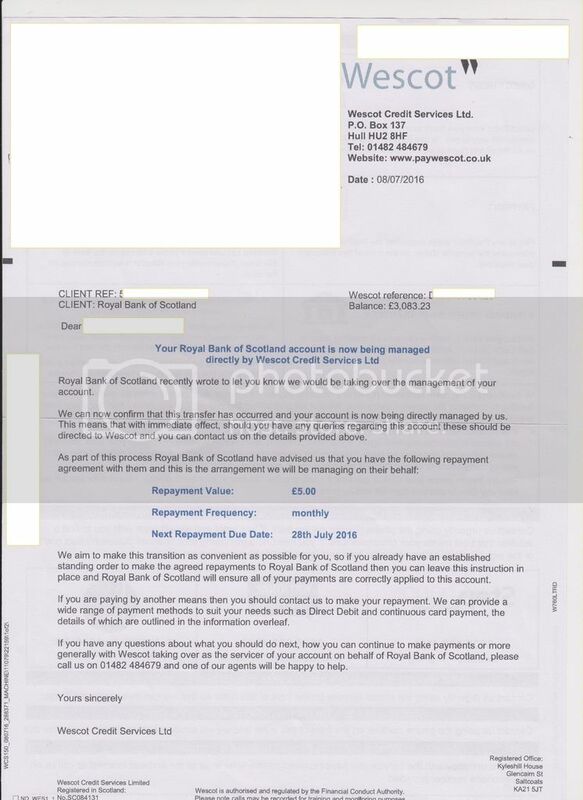 My so-called “debt” is with Royal Bank of Scotland and I will continue to deal directly with the contact information I have with Royal Bank of Scotland. If I receive any threatening letters or phone calls from Wescot Credit Services Ltd, I will take this as harassment and court action will pursue. I would recommend to inform them of that as you obviously have direct dealing with them. In conclusion I am happy (at the moment) to continue paying Mint (Royal Bank of Scotland) £5.00 (five pounds) per calendar month to pay my “debt” which at present stands at £3078.23 as of my July 28th 2016 balance. and esp the silly bit about charging them. Thanks for reply....I've changed a bit but my father seems happy with most of it. It's been around a year but there's an update on my fathers account. He received a letter from Mint on the 18th August 2017 giving him "notice" of "assignment" of the debt to Cabot Financial Limited. This assignment was made on the 3rd July 2017 without informing my father. The letter states that Wescot will continue to mange the account on Mints behalf. Total debt owed £3033.23 (He has agreed to pay £5 per month - he is 70 and can only afford this). He has missed no payment dates. The letter states he should start paying Wescot Credit Services Limited with a new Sort Code and account number. It states that any payments made direct to Mint will be made to Wescot on his behalf but it would be important that the changes are made asap. My question is how do I reply to this letter. Do I state that he does not agree with the new agreement. His debt is wit Mint - not Wescot. Does he state that Wescot must have paid his debt and that he now owes Mint zero ?? I've told him to continue paying the £5 per month to Mint until I get a reply on here. I've just noticed there is a second letter attached to this from Wescot. It actually states that Wescot (Cabot Financial) have bought the "account" held with Mint. 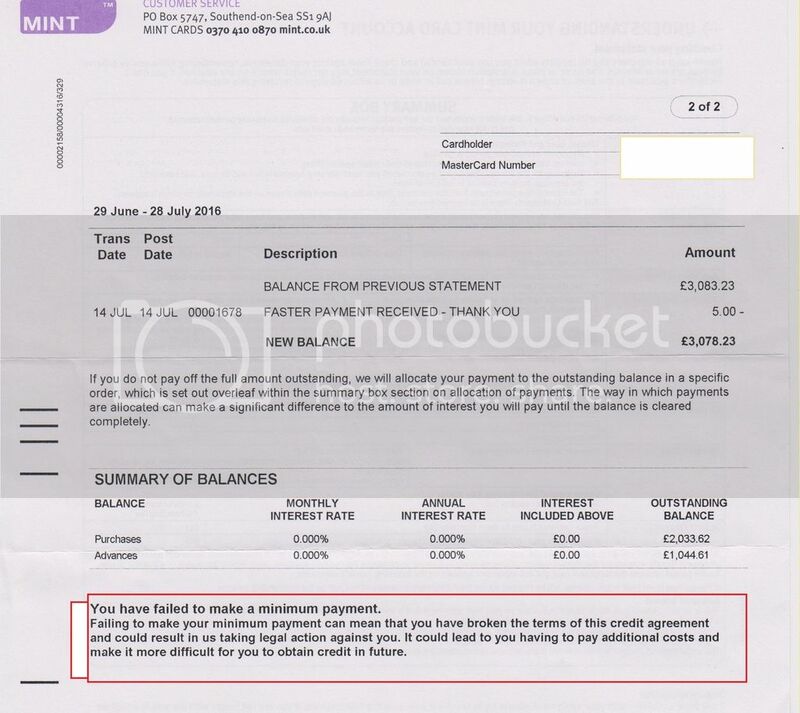 It states on the letter the debt is £3018.23. I assume they have purchased the debt - I won't be contacting them and I'll inform my father to have no dealings with them. I might inform them that he can now only afford a £1 per month ! now the time to send a CCA request to cabot. you CANCEL the SO to whomever its going too.